A Peterhead man who had his locks shaved off for charity has smashed his fundraising target. Not only did Stephen Baker have his hair cut off for the Little Princess Trust, he set out to raise £300 for CLAN Cancer Support. But the local lad is delighted to have found his Just Giving page has reached a magnificent £1,022. Stephen had been letting his hair grow for the past four years as he found he just couldn’t afford to pay for haircuts every six weeks. He told the Buchanie: “I haven’t worked for three years due to my health and being my partner’s carer so I have continued to be a rebel. “I get a lot of attention for looking like Roger Daltrey from The Who or Robert Plant. Stephen had his hair chopped off on August 6 at CLAN House in Aberdeen and has now sent off his locks to the Little Princess Trust which uses donated hair to create wigs for children and young people who have lost their own hair due to cancer or other illnesses. Stephen told us: “I had been fundraising for over five weeks thinking I may reach £200-£300. “I didn’t add a total to reach on my Just Giving page but it automatically set to £900 and I thought I would never reach that. 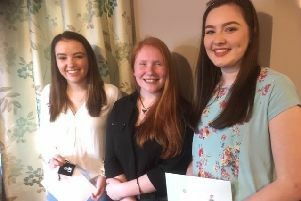 “But I’ve been taken by surprise with people’s generosity, probably due to it being for CLAN Cancer Support which does such great work across Aberdeenshire right up to Shetland.